It's been awhile since I shared some blogging failures with you, so here goes. 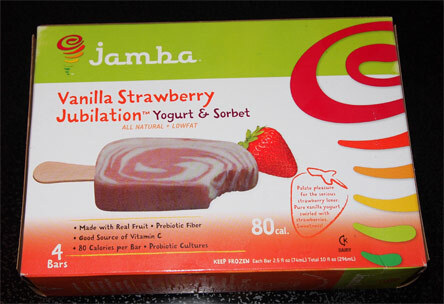 Jamba Vanilla Strawberry Jubilation all natural yogurt & sorbet bars. These have got to be at least a year old and were way, way, way, way at the bottom of the basement freezer... but maybe they'll be ok? NOPE! No Way I'm eating that. I unwrapped all four bars and they were all pretty bad looking. I had been saving this last container of Velvet ice cream for a special occasion... an occasion I like to call "Tuesday". 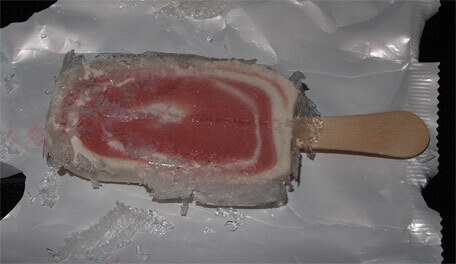 Ahhhh, couldn't resist, I'm tired and I need me some free ice cream. Let's see how this one stacks up against their excellent Buckeye Classic flavor. 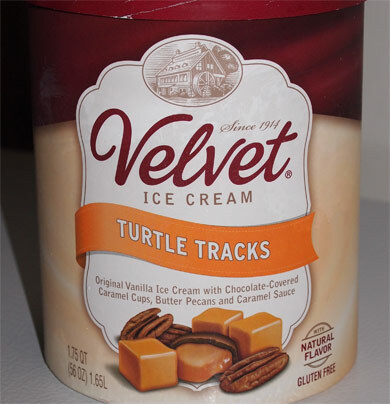 This is velvet Turtle Tracks ice cream, and I don't know why I didn't photograph it, but the ice cream inside had literally sunken down about two inches from the top. Apparently the basement freezer has been working overtime this summer. Whoops. No more storing my ice cream on that top plastic shelf, it all stays on the bottom of the freezer from now on! And lastly we have a bagging failure. See, I'm one of those OCD folks that puts all of his cold stuff together on the conveyor belt at the grocery store. I figure it's the best chance at me getting all my cold stuff bagged together.... but it's an imperfect system. 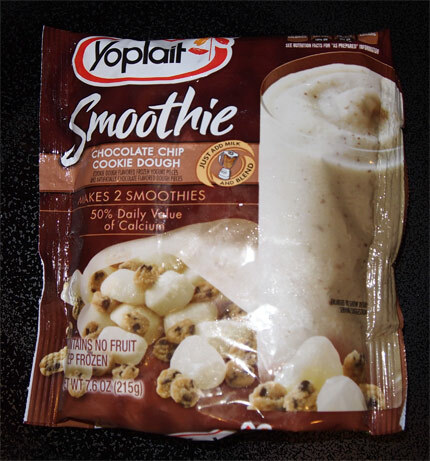 This is a new(ish) frozen Yoplait Smoothie, the chocolate chip cookie dough version 'cause that's how I roll. Unfortunately I discovered it about an hour after I had put away all the cold groceries. (it was sitting with the chips and crackers and whatnot). 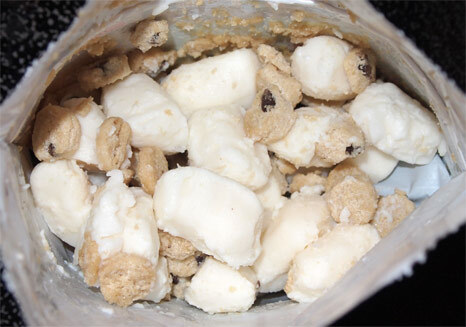 Strangely enough, the bag was still kind of cool, in fact, the yogurt bits are still solid... though if you look at the top of the picture, you'll see the cookie dough has starting melting and is stuck to the bag.... man I debated back and forth about whether or not I should eat this one. This is going to turn into two servings? Well, I tried making it anyway.... maybe this jam wouldn't have happened if I had used a blender as directed. 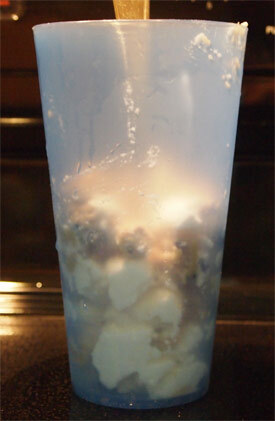 I didn't really drink much of it, just a taste, but it was enough of a taste to know that I'd rather make my own shakes. If I remember right, there was something funky with the cookie dough... ok, ok, technically I ate some of the cookie dough before putting it in the cup, I couldn't help myself! 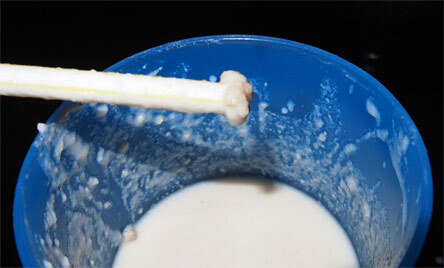 Ok, I think that's enough failures for now, have a good night!